I finished Canticle last night. The experience of is a little surreal. The story has cooled enough that it doesn’t feel like my own and that gives me a better appreciation of it. And more importantly, it’s giving me a better connection to it and to the characters as I gear up to lay down the last 75k words in the last book. So…scattered thoughts. 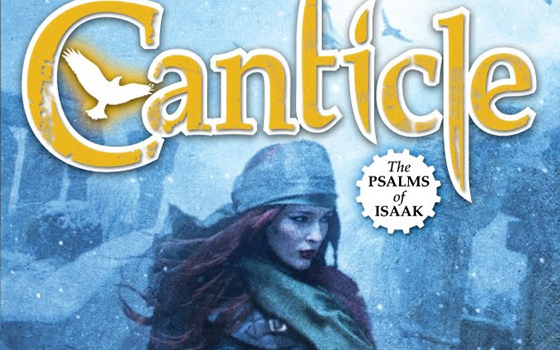 I remember starting Canticle around the same time thatLamentation had landed on Beth Meacham’s desk at Tor. So probably in the spring or summer of 2007. I know I was quite a ways into it when my Mom died in November 2007, just a month after Tor made an offer on the five book series. Usually, you don’t start writing the second book of a series unless you’ve found a home for the first. But everyone’s reaction to Lamentation — and just how quickly it landed me an agent — had me feeling like it was a reasonable risk. I’d just figured out that the series was going to be five books, not three. Which was up quite a bit from the short story — no, wait, FOUR short stories, no wait, ONE NOVELLA LENGTH TALE MADE UP OF FOUR SHORT STORIES, NO WAIT — that it all started out as. In Canticle, I was being more intentional and less driven by the terror I was outrunning with Lamentation. And in Canticle, I also got deeper into the heads of Vlad Li Tam and Winters. I’d learned (from Jay Lake’s Death of a Starship) how fun it could be to play protagonists against each other. Sending Rudolfo off to find Vlad Li Tam — a man he vowed to kill at the end of Lamentation — in order to save his son Jin Li Tam taking the Wandering Army out for a spin in Rudolfo’s absence, her newborn and nursemaid along for the ride. The deepening mythos around the Home-seeking Dream and Nebios ben Hebda. Petronus’s reckoning and his reluctant role in validating a bloodthirsty new gospel in the Named Lands. This time through it really struck me how much this book — probably the entire series — is about family as much as it is about how people are shaped by trauma and loss. But the family theme is particularly strong in this book with the birth of Jakob (written two years before I experienced the birth of my own daughters). The tension between Jin Li Tam’s roles as mother and queen juxtaposed against a lifetime of being the forty-second daughter of Vlad Li Tam. The loss of Winters’ innocence along with the death of her foster-father-figure/shadow Hanric and…over the course of the book…her loss of Neb to Renard and the Wastes..and her loss of faith in the dreams she grew up on. And the hardest part of this series for me to write or read: The price paid by House Li Tam in Vlad’s kin-healing with Ria. When that blood-letting really started in earnest, I remember checking in with Beth. “I’m afraid it’s just too dark,” I told her. “Ken,” she said in her most matter-of-fact tone, “you committed genocide on the first page of Lamentation. It’s really not too dark.” Still, they were hard to write but it felt true and had that Old Testament Brutality that would produce the Vlad Li Tam we see in Requiem and Hymn. Those scenes in Canticle in the Blood Temple got me my first bit of hate mail. Well, actually a big long love letter about Lamentation followed by a big long hate letter about Canticle and a promise to never read my work again if I didn’t promise (in turn) to stop writing such dark things. Speaking of dark, Ria was a nice surprise. And really, she continues to surprise. In my readthrough, I realized that she needs a few scenes of her own in the last book. Contrary to popular belief, she was spontaneously created like most of the series and its characters. No planning really. She just showed up all syrupy sweet and ready to see Vlad and his family redeemed. But in reading Canticle this time, I started understanding what some fans meant when they talked about my command center being covered in white boards and sticky notes. It’s definitely a complex, intertwined story. I have no idea how I’m keeping it all straight. Odd bit of trivia: Canticle is actually the only of the books to be outlined. And I’ve never opened the document since saving and closing it. I just started writing the book and kept going. Maybe that practice will change but it sure doesn’t seem like my standard MO. Though I think the old dog could use a new trick there. About the same time I was working on Canticle, I was also working on “A Weeping Czar Beholds the Fallen Moon,” a novelette that ties into the series and fleshes out an important bit of backstory. When I stalled after my Mom died, I was able to wrap the novelette first and place it with Tor.com. I added freely from that mythos, especially in the tail end of the book between Neb’s discovery beneath the locked hatch and Vlad’s discovery beneath the waves…. There are two new characters in the book that I’m especially fond of. First is Renard, the Waste Guide. I based him on my life-long childhood pal, Robert, who the book is dedicated to. He introduced me to sword and sorcery and D&D and Joust. He also was the kid who taught me to slip out of the harness and mix my Planet of the Ape figures with my Star Trek and DC Comics figures. And traded me a one-legged Big Jim with a trenchcoat and hunting rifle as the world’s most well-disguised and lethal hitman. Oh, and the kid who taught me (in the fourth grade) that other kids might beat me up less on the bus if I left my dolls at home. I don’t know how many bullies he ran off for me. Absolutely Jim Nightshade to my Will Halloway. And I tend to write the people I care about into my stories. Or at least, fictionalized renderings of them stretched and twisted. I based Renard off of Robert and his D&D thief character and turned him loose in the Wastes. The other is Esarov the Democrat. Esarov is Bulgarian for lake and at the time, Jay was really stepping up his political discourse online over at LJ. So I made him an Androfrancine turned actor turned revolutionary on the Delta. I’m just a few days out from the one year anniversary of Jay’s death so it’s bittersweet to see that tribute to him there. It has me wondering what should happen to his character at the end of the series? Thoughts? I won’t tell you mine but here’s a chance for YOU to weigh in. I finished Canticle at the end of April 2008 in a 13k word weekend binge fueled by Ibuprofen, Chinese takeout and Diet Coke. I was on the last paragraph when my Dad called to tell me how much he loved Lamentation. It was the first time he ever raved to me about anything I’d done and the first time he’d ever told me he was proud of me. It is a cherished memory. Of course, he didn’t love Canticle when he read it later. “It just didn’t feel like the story was finished, Kenneth.” He was nearly eighty. I didn’t try to explain about series. He would keep living despite the dead he buried. He would love his wife and his son, and he would spend himself for the light he’d gained from his time in darkness. Even in Desolation, Rudolfo thought, life asserts itself. Favorite scene: The death of Ignatio…which was the only scene added in after I finished the book’s first draft. Okay, even as I write this, I’m a quarter of the way into Antiphon and building speed. I’ll be back to work on Hymn in no time. Once again, give the audios a try. You won’t be disappointed. And as before, happy to take questions on the book.